Grafik (now defunct) was a UK-based design magazine, formerly known as Graphics International. It shouldn’t be confused with Graphic (another UK-based magazine, currently known as Elephant), or Graphic (a more recent Korean design magazine). 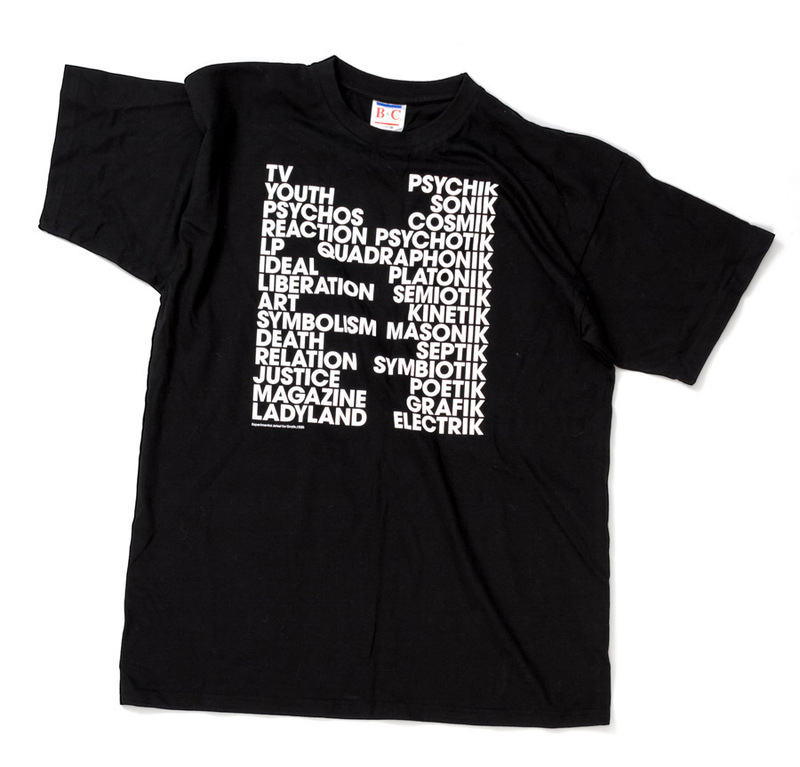 In 2005, we were asked by Angharad Lewis and Caroline Roberts (editors of Grafik) to design an exclusive t-shirt for the magazine – a shirt that would be used as a present for subscribers, but could also be ordered from the magazine. Thinking about a good starting point for such a shirt, we decided to reflect of the specific spelling of the title of the magazine, ‘Grafik’. When we hear the word ‘Grafik’, the first thing we think of is the teutophile way in which fans of krautrock refer to that genre’s typical 4/4 drumbeat: ‘Motorik’. However, for the Grafik shirt, we went a slightly different route. For that shirt, we were actually in a more ‘industrial’ mood. In short, the spelling of ‘Grafik’ reminded us of Psychic TV, a UK-based band from the Eighties (fronted by Throbbing Gristle’s Genesis P. Orridge). Or rather, it didn’t remind us of the band itself, but more of their cult-like fanclub: Thee Temple ov Psychick Youth (TOPY). Followers of this organization used (and still use) this typical, pseudo-Old English language, in which ‘the' is replaced by ‘thee’, ‘of’ is replaced by ‘ov’, and ‘-ic’ is replaced by ‘-ick’. A language that is obviously very much inspired by the ‘magickal’ writings of Aleister Crowley (1875–1947). We thought this idea (of unusual spelling as a manifestation of occultism) was kind of interesting. Or at least, we figured it could be a nice subject for a t-shirt. (Of course, for Grafik, we wanted to focus on ‘-ik’ rather than ‘-ick’). Thinking about matters such as ‘-ic’, ‘-ick’ and ‘-ik’, we were reminded of some great bands who also used the regular ‘-ic’ ending: bands like Sonic Youth, Cosmic Psychos, Septic Death, etc. And then there are also all these small contemporary garage bands like The Masonics, The Cynics, etc. In other words, we suddenly saw the (small but important) role of the ‘-ic’ ending in pop music and rock culture. Long story short – we made a list of a couple of these bands, and also added some titles of songs and albums (‘Psychotic Reaction’, ‘Electric Ladyland’), and some common phrases (‘Kinetic Art’, ‘Symbiotic Relationship’, ‘Poetic Justice’, etc.). We then changed the endings of all these words from ‘ic’ to ‘ik’, and included the word ‘Grafik’. This list became the design we printed on the shirt (working title: ‘Thee Temple ov Grafik Youth’). 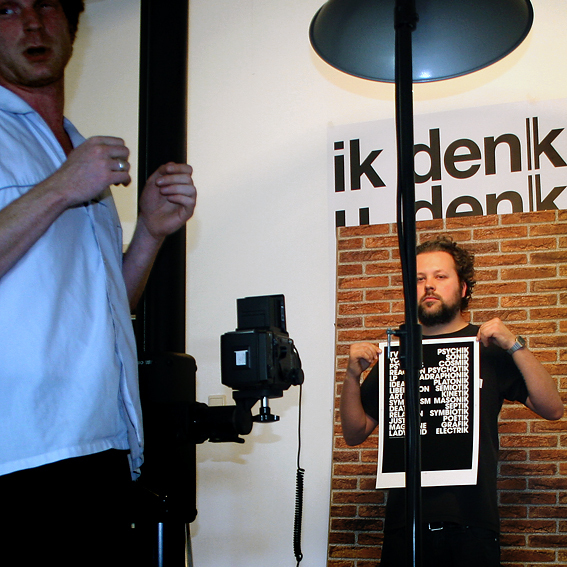 Before the shirt was actually screenprinted, Grafik already wanted to publish an image of it. Because we generally dislike showing ‘flat’ digital pictures (especially when it comes to t-shirts), we asked our friend Johannes Schwartz to make a photograph of one of us, holding a print-out of the design in front of a blank shirt. A picture of ‘the-making-of’ this photograph can be seen by clicking on the image. A detail of the design also appeared on the cover of issue 134 of Grafik (November 2005). Thanks to Angharad Lewis and Caroline Roberts.